While you are visiting the Inn you might be of a mind to explore some back country roads, poke around in some shops and antique stores, and perhaps do a bit of shopping in advance for the Christmas season. Or you may merely wish to bring home some useful additions to your kitchen and dining room. 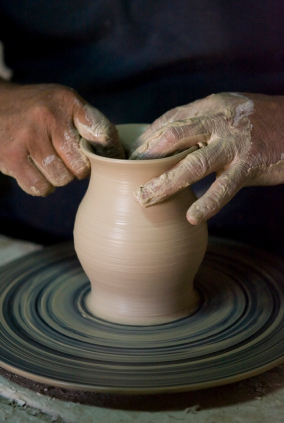 The area has some wonderful pottery shops and studios, offering a large selection of lovingly handmade creative and unique pottery items, as well as offering some pottery classes and workshops for those who would like to feel the warm clay between their fingers and experience creating something unique. The Cornwall Bridge Pottery Store offers a 5000 square foot store with a huge selection of handmade pottery for every occasion. They have been producing woodfired pots, lamps, dining ware and more for more than 45 years. While you visit the store you can watch their potters at work on their pottery wheels as they create new pottery pieces for sale. Milkhouse Pottery is created with white or brown clay in functional pieces suitable for all occasions. The artist makes her own glazes, and often experiments with different combinations and layers. The potteyware is decorate in nature, but also fully functional for daily use and quite durable. The studio is also home to small year-round classes of 4 people, where the small group setting offers one on one experiences so each attendee can work at their own skill level and comfort. A pottery studio offering functional and decorative ceramics, pottery classes as well as workshops. Classes are ongoing and session groupings of 5, 10 or 20 classes are available. There are also weekly classes at all levels. Workshops are generally intermediate or advanced skill levels. 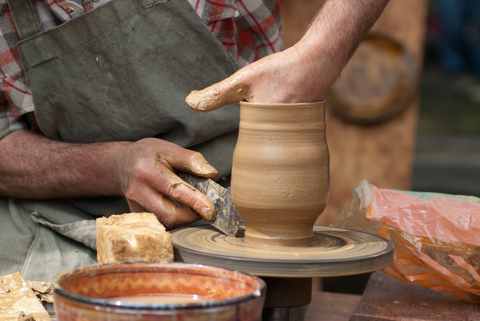 Class topics include wheel throwing and hand building techniques, decorating and glazing. A quote from his website put his art into perspective: The architecture of the piece is my passion and is why I can look at 18th and 19th century English flowerpots and centuries old Asian vases with the same eye and ask the same question: What makes this antique pot so wonderful? The answer always comes back to the architectural integrity of the pot and the potter’s reverance and knowledge of the materials he is using. The potter knew where he was going in the making of that particular pot. This is where traditional craftsmanship is born: The knowledge of a particular material and its attributes after years of working with it and respecting the true potential of that material. Guy Wolff specializes in historical and antique inspired crockery with a lovely selection of styles and types ranking from crockery to flower pots. Stop in and visit as they throw pots almost daily. Ben is the son of Guy Wolff, and grew up watching his father throw pottery in his shop in Woodville, CT. A potter from the very beginning, Ben was working with clay from a very young age. Ben uses a large selection of clays, glazes and finishes on his work and offers a wide variety of potteryware ranging from flower pots to decorate pieces to durable dining ware In addition to being a potter, Ben is also a musician and plays an array of different instruments and styles of music in bands. For more information on Ben’s music visit his music page https://benwolffpottery.com/pages/music. Ben was also featured on the Martha Stewart Show. “The Pot Show with Jimmy Fallon”, check it out at http://www.marthastewart.com/991033/pottery-ben-and-guy-wolff. The Hollister House Garden located in Washington Connecticut is inviting garden and music enthusiasts to celebrate the official beginning of summer with a classical music concert presented by The New Baroque Soloists led by creative director, Douglas Myers. ‘Festive Music for the Summer Solstice’ also known as ‘Music in the Garden’ will be held on the main lawn of the garden on Sunday, June 18th at 5 p.m. All are invited to bring a picnic – rosé wine and sparkling water are provided. Open Your Eyes Studio Tour organized by the Northwest Arts Council on June 24 and June 25 in the charming towns of Salisbury and Sharon gives you the opportunity to visit artists in these studios and learn about their creative process. This year there are thirty-one studios on the tour and feature artists in many mediums from oil and water color paintings to potters and jewelry makers and much more. The tour is free. Visit the website for tour maps, directions, itineraries and preview party information.